If you’re trying to diagnose and troubleshoot a performance issue on a PC it can be daunting to try and figure out where you can get the right information. In Windows 10, Microsoft make it very easy to get high quality, live information about the current status of the PC from the Task Manager. Open the Task Manager by pressing Ctrl+Alt+Del or by right-clicking on the Taskbar and selecting Task Manager from the menu that appears. 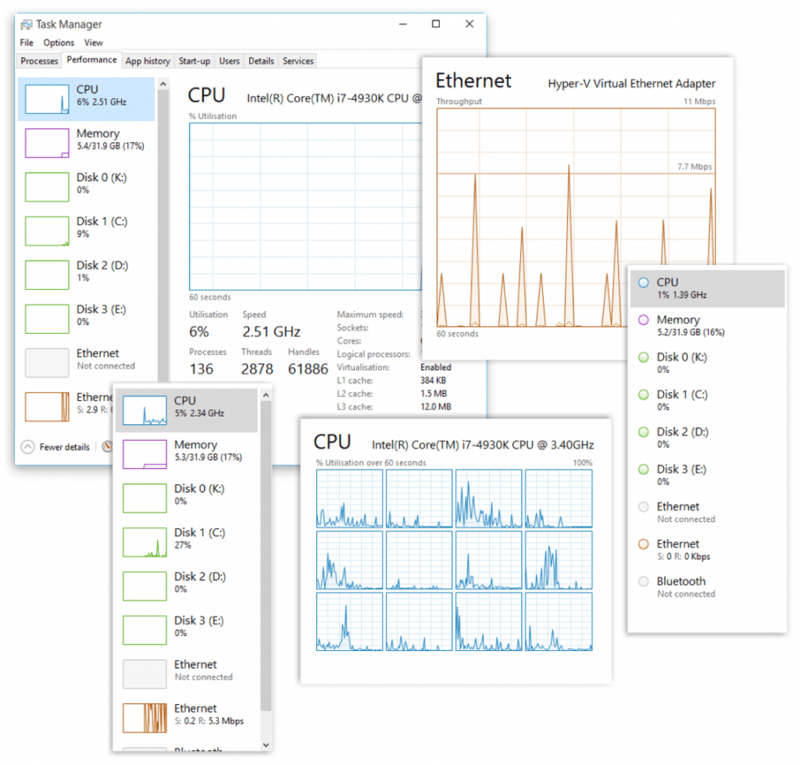 With the Task Manager open, click on the Performance tab and you will see selectable graphs for your CPU (professor), Memory, Disk(s), Network connection(s), and GPU (Graphics processor). There are now different things you can do with these graphs, which are activated by right-clicking on the graphs themselves. This includes being able to change the view, such as viewing individual processor core activity instead of the processor as a whole, or turning the Task Manager into a mini-live diagnostic panel you can leave running on your desktop. It’s well worth spending a little time playing with the various views and options available to you in the Start Menu’s Performance panel, as the different views can make finding a snarl up, such as a network drop-out, or an app that chews memory or processor time, much simpler and easy to manage.